O'Hara Elementary PTO – Welcome O'Hara Parents! The 2019 O’Hara Elementary School Spring Basket Fundraiser is here! This fundraiser is an annual favorite for students, staff and parents alike. It’s also O’Hara PTO’s largest fundraiser – last year we raised close to $9,000! Money raised helps the PTO fund teacher stipends, assemblies, courtyard improvements, and more. Students in each class contribute items based on a set theme, and then PTO volunteers assemble the baskets. The baskets will be on display in the Commons Area the week of April 1 – 5, during which time students can purchase raffle tickets from PTO volunteers at school. Tickets will also be on sale in the evening during the April 2 Showcase Night. Kindergarten families may also purchase tickets at the March 22nd Seuss on the Loose performance. Each student receives one free ticket for a chance to win the basket of their choosing. Basket winners are randomly drawn on April 5th after school, and winners are notified by email. Donations DO NOT need to be expensive, but something a child would enjoy receiving. For example, If your child has “Craft Craze,” you could send in Popsicle sticks, glue, pipe cleaners, etc. Each student will receive one free ticket. Parents, staff, and students may purchase additional tickets during the school day (8:40am – 3:45pm): 1 for $1, 12 for $10, and 30 for $20. Cash and checks payable to OEPTO are accepted. Students will need to write their name (first and last) and their homeroom teacher’s name on the back of each ticket. Kindergarten Families: One thing that we have noticed in the past is that our Kindergarten students need a little extra time to write their name and their homeroom teacher’s name on their tickets. Our hope is that they bring their tickets home to write their name and their teacher’s name on each ticket, they then can put the tickets in the baskets the next morning. We will be providing plastic bags (grab and go bags) for students to keep their tickets together for the trip home and back to school. We thank you for helping us make the experience easier for the younger students at the school. Kindergarten families will also be able to purchase tickets before and after the March 22nd performance of Seuss on the Loose. Winners will be announced on April 5th via email. Parents are welcome to sign in to view baskets and purchase tickets. Anyone without clearances will need escorted by a staff member. Tickets will also be on sale in the evening during the April 2 Showcase Night (5pm – 7pm). We appreciate the support and participation of all the families and students with this fundraiser. Meeting Recap: Upcoming Events, Girls on the Run, Safety Update and More! Casey White, head coach of the O’Hara Elementary Girls on the Run team, joined us to share information on the upcoming GOTR session. The O’Hara team is open to girls in grades 3 – 5 and will meet Tuesday and Thursdays from 6:00 – 7:30pm from March 12 – May 30. Registration closes March 8th. Friday’s Family Movie Night brought 300 people to the O’Hara “movie theater” for a free family event benefiting the Sharpsburg Community Library. O’Hara’s fundraiser recently received a shout out from the Mayor of Sharpsburg! Thank you to everyone who donated and attended! 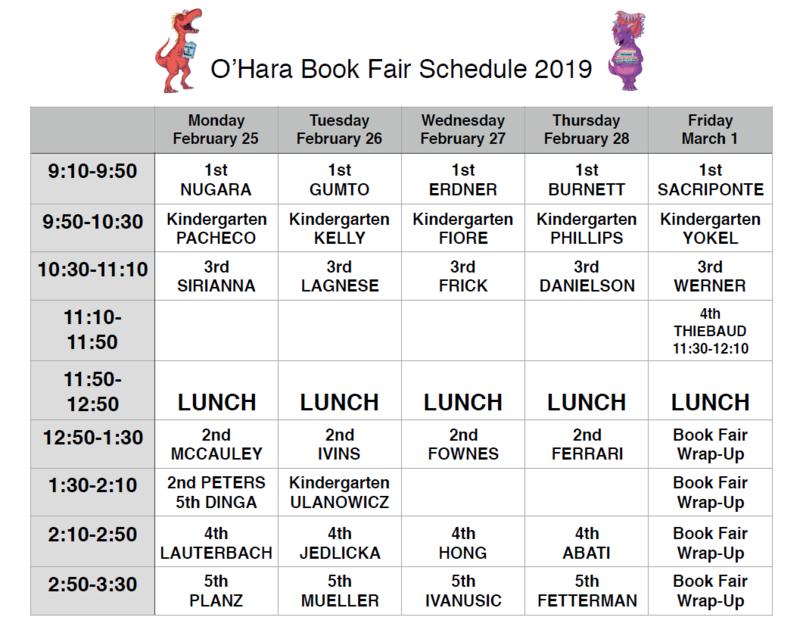 The Scholastic Book Fair benefiting O’Hara’s library kicks off 2/25 and runs through 3/1. Evening hours of the book fair will coincide with a Read Across America Celebration on 2/26 from 6pm – 8pm. The OFC continues to add programs and plan for future after school activities. Registration is currently open for K-2 students to participate in Lab Ratz. Planned programs include a second session of Spanish Globetrotters, more yoga and a Spring session of Chess Club. We will also be introducing “Story Explorers” in April. Story Explorers is a new OFC program being facilitated by O’Hara parent and Spark Books owner, Adriene Rister, and a Fairview parent/engineer, Melinda Guinn. This five-week program is designed for children in ages K-1 and will combine literacy and STEAM activities. The pilot session will focus on the classic children’s story, The Three Little Pigs. Each week, students will begin class by gathering together to read children’s literature based on the Three Little Pigs story, such as The Three Little Pigs: An Architectural Tale by Steven Guarnaccia, The Three Little Wolves and the Big Bad Pig by Eugene Trivizas, and the True Story of the Three Little Pigs by Jon Scisezka. After reading the book, children will use their imaginations and problem-solving skills to explore the story in greater depth–acting out different characters to create alternative endings, building houses that can withstand a wolf, learning about perspective (did the wolf just have a cold? ), and becoming the story’s illustrator, author, or using only music to tell the story. Registration will open in March – stay tuned for more details! 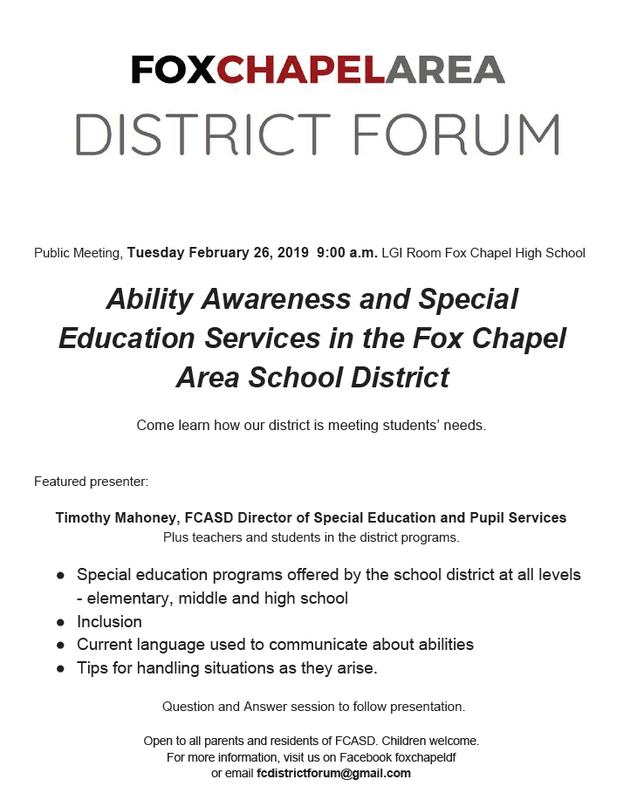 The next public meeting will be held Tuesday, Feb 26th at 9:00 a.m. Tim Mahoney, Director of Special Education and Pupil Services will be sharing information on Ability Awareness and Special Education Services. Mrs. Batis provided an update on school safety. O’Hara staff have completed another round of A.L.I.C.E. training. Additionally, Officer Lynch will be coordinating reverse evacuation drills (what to do if we are outside and need to get in quickly). Families will receive more information before the drills, which will be conducted starting with our oldest students first. Reverse evacuation can be used for a variety of situations, including severe weather or in response to events occurring within the vicinity of the school. Mrs. Batis also shared an update on the instructional decision making process. A copy of the presentation will be posted here when available. Key takeaway: you can request a meeting at any point in time if you have concerns about reading, math, social/behavior issues, etc. and to explore appropriate interventions or enrichment opportunities. Several new ideas were discussed, including the possibility of a student store, a family dance night and ways to show our appreciation for teachers. Stay tuned for a survey from the PTO to gather more ideas for next year and to provide feedback on your experiences to date. The PTO board will be meeting soon to kick off our planning for the next school year and we value your feedback! Principal Update – Mrs. Batis will share a security update as well as information on the instructional decision making process. Special Guest – The O’Hara Elementary Girls on the Run team leader will share information on the upcoming Spring session. District Update – Sari Brecosky, Director of Literacy, will join us. Reports from our District Forum, Teacher and PALS reps.
PTO Board and Committee Updates – your chance to hear about upcoming projects, volunteer opportunities and more!